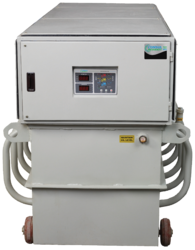 Pioneers in the industry, we offer oil cooled servo voltage stabilizer from India. Consul Neowatt is the No 1 Servo Controlled Voltage Stabilizer (SCVS) brand in India and comes with an industry leading 5 Year Warranty. The stabilizers are rugged and proven over 30 years. Oil cooled stabilizer are available in a range from 3–3500 kVA. Consul Neowatt SCVS is suitable for CNC Machines, CMM, Textile & Spinning mills, Cold Storage units, Food processing equipment, CT Scan, MRI machines, Retail outlets, Restaurants and Office applications. B) Electronic overload protection and short circuit protection up to 30 kVA through MCB and the Manual bypass is built in. Above 30 kVA MCB/MCCB is optional.